I want to write a bit about the birth of the twins, because I want to give hope to others out there who want to be able to give birth to twins naturally. It seemed that wherever I turned when I was pregnant, there wasn't a soul to be found who hadn't had a horrifying twin birth story that ended in c-section. But before I talk about the twins, I need to talk about Pierce, because so much of what occured in my pregnancy with him affected my decisions in my pregnancy with the twins. My husband and I were married almost 10 years before deciding to have children. The first 14 weeks of my pregnancy were marked with constant morning sickness. I wore seabands, sipped Gatorade, tried ginger pills, took unisom/b6, and on a couple of occassions when I had to present in court for my job, took Zofran. I had nausea so bad that a couple of times I woke up in the night and the waves of queasiness wrapped around me so hard I was scared to move for fear I would vomit all over myself. It was a long, long first trimester. Sometimes I would just sit there watching the seconds tick by on the clock, wanting the illness to let up and wondering if I would ever feel normal again. And then finally, it lifted. And while the second trimester was an improvement, I've never been one of those people who enjoys being pregnant. I love the end result. But not the pregnancy. I actually longed for labor, looked forward to it, just so the pregnancy could be over. My blood pressure, which seemed to jump up the day I conceived, continued to rise during the 2nd trimester. I'd never had high blood pressure a day in my life, but pregnancy seemed to be a contributor to hypertension for me. By early in the third trimester, I was preeclampic. At 32 weeks, I had alarming swelling all the way up my legs and in my face. I looked like the Marshmallow Man from Ghostbusters (and in fact, didn't allow any pictures of myself after this point). My doctor had me come in and my blood pressure was 170/110. And so I was put on partial bed rest. The bed rest helped, a lot. But I couldn't stay away from google and spent a lot of time horrifying myself with stories online of preeclampsia that had tragic endings. 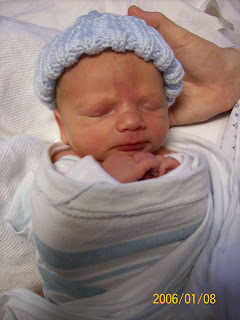 By 37 weeks it was very clear that Pierce wasn't growing well anymore because my blood pressure was so high. An induction was scheduled for 38 weeks 2 days. My doctor was scheduled for neck surgery at the same time, so I had my second choice doctor (which was a good thing, since the other 3 doctors in the practice I didn't like). I went in on a Monday evening at 5:00 for Cervadil. 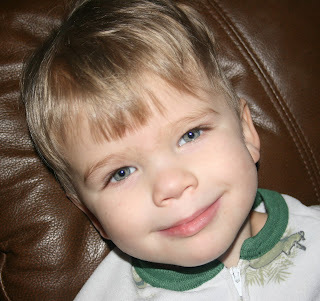 The next morning, with no dilation, we decided to proceed with Pitocin. At 4:30 that afternoon with only 3 cm dilation, they broke my water. I had two epidurals, neither of which took, yet they caused issues by giving me a fever and causing some heart decelerations in Pierce. I never knew at the time this was a potential risk of epidurals. Ill-prepared to deal with the pain, I waited and waited for the doctor. At 9:30 she rolled in, and I had been ready to push for a while - but no one checked me and they ignored my claims and tears that the epidurals did not work. We were fortunate, though. A couple of pushes and Pierce was out safely at 9:40 pm. What a long 28 hours 40 minutes it had been. 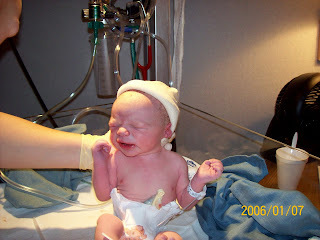 Due to the growth restriction from the preeclampsia, he was only 5 lbs. 11 ounces. I recall that his fingernails were totally black when he was born. Yet he was healthy and safely in the world, so that was all that mattered. I made a commitment to myself that if I ever had another child, I would be better prepared. Since I knew that epidurals didn't really work for me (and was now aware of some of the dangers they posed), I wanted to go in ready to proceed with a completely natural labor and delivery. I love that picture of Pierce. What a sweetie! Wow, your first pregnancy did not sound like fun. Ugh, morning sickness. I still occasionally get flash backs. Pierce is beautiful. I love his eyes! I anxiously await the story of finding out you were pregnant with twins...and the decisions you made leading up their births.